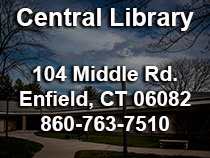 The Enfield Public Library offers free and discounted passes to many area museums and attractions. These passes have been generously purchased for your enjoyment by the Friends of the Enfield Library. Patrons can check out the passes on a first-come, first-served basis at the library’s circulation desk. The individual passes are good for one day and cannot be renewed. They must be returned to the Enfield Central Library. The late charge on Museum Passes is $5 a day. For more information about the passes please call 860-763-7512. 50% admission for up to 6 people.